The ‘Tesla Minibus’, which is also only a placeholder name for now, is another upcoming Tesla vehicle in early stages of development confirmed by CEO Elon Musk when revealing his ‘Master Plan Part Deux’. While in early stages of development, Musk confirmed that the vehicle is being built on the Model X chassis, which should make easier to bring to production. Musk said that the bus is inspired by the “California Custom VW combi design art”. 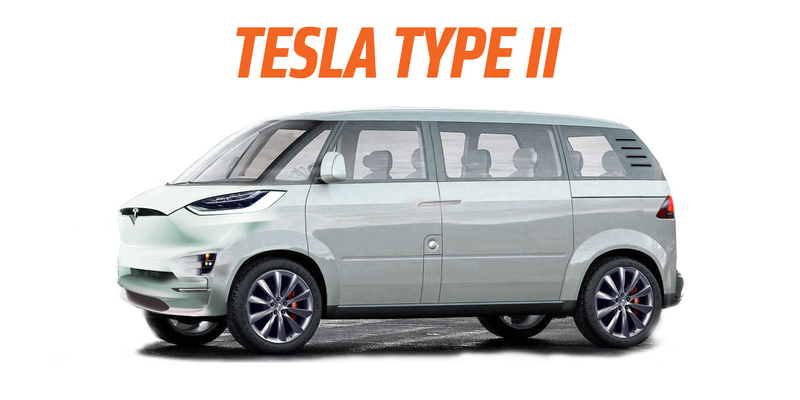 Jalopnik came up with the rendering seen above to help visualize what it could look like. The CEO referred to the same timeline for unveiling and production as the other vehicles confirmed in his ‘Master Plan’: an unveiling of the concept in “6 to 9 months”, which should mean in early to mid-2017. It is expected to be in production within the next 3 to 4 years (2019-2020). During a conference call with analysts following Tesla’s first quarter financial results yesterday, CEO Elon Musk gave several updates on Tesla’s new vehicle programs, like Tesla Semi and Model Y, but he also made it sound like the company could let go of its minibus program. Tesla has long been a 1-car company. From when it first started production of the Roadster in 2008 to the end of the program and the start of Model S production in 2012 — and finally to last year when Tesla started delivering the Model X. The automaker has only been really producing two different models in volume for the past few months and it’s a significant accomplishment for a new automaker. Elon Musk has been on a quest to bring ‘S3XY’ back with Tesla’s vehicle naming convention. First with the Model S, ‘S’ for sedan, and Model X, ‘X’ for the look of the Falcon Wing doors, and now with the upcoming Model 3 and Y. Following last week’s announcement that Tesla will bring to market a self-driving ‘minibus’, CEO Elon Musk now confirmed that the vehicle will be built on the Model X chassis – hinting at the vehicle potentially coming to market sooner than anticipated by leveraging the work already done for the automaker’s SUV.